I've been reading Volume 2 of Chesterton's collected works, which includes The Everlasting Man and his biographies of Saints Francis and Thomas. Chesterton, along with C.S. Lewis, is of course one of the more enduringly popular Christian apologists. Back in 2007 we devoted a long-forgotten series of posts to his Orthodoxy (1908), which was actually written prior to his being received into the Church. The Everlasting Man (1925) is a post-conversion meditation on some of the same themes. I find that Chesterton's style of writing takes some getting used to. He is definitely not the most organized thinker, let alone systematic, nor is he concise. The word "sprawling" comes to mind. Undisciplined. At times we see a kind of back-and-forth between insipid intellectual laziness and inspired poetic energy that sends sparks flying from the page. It almost reads as if it were dictated during a manic episode and then not edited. A typical paragraph fills a whole page, and he throws in all sorts of then-contemporary references that make no sense to us now, often as targets of good-natured opprobrium. He easily veers into irrelevant tangents, nor can he resist the most formulaic wordplay and cringe-making puns. Furthermore, being that he is essentially a journalist, he has no particular qualifications to bloviate on matters that are best left to highly trained philosophers, theologians, scientists, and metaphysicians. In short, this man is a Raccoon! I immediately thought of him this morning when reading this awful story about some goofy kids in Iran being whipped and imprisoned for being goofy kids and having fun. Can you imagine? No, you cannot. Why? Because you have been Christianized in a civilization that has been slowly leavened by Christian joy for the past two millennia. Indeed, the joylessness of the mullahs resembles nothing so much as the dreadful joylessness of the spiritual gulag of leftism. Neither permits real joy. Where the left differs from Islam is that it not only permits but encourages the joyless pursuit of pleasure, i.e., the daily grind of the hedonic treadmill. Also, the left won't whip you (yet) for being politically incorrect, just ruin your reputation and career: "Authorities arrested the group for contravening Iran’s strict vulgarity laws, which prohibit public displays of dancing.... The Islamic Republic condemned the video as a 'vulgar clip which hurt public chastity,'" and "the whole group was told they would receive 91 lashes each." I checked out the video, and it is interesting how their dancing is so charmingly awkward and stiff -- as if they have just been incarnated and are getting used to having bodies. It reminds me of a story I read about 15 years ago, about special classes in Japan where they teach people how to smile. Now, the music to which they are dancing is African American, and such music could only have arisen in America. The song is quite overtly retro, and sounds like an unreleased Curtis Mayfield tune from the early '70s (Prof. Wiki agrees), back when black music was still joyously liberating instead of angry, repulsive, and animalistic. The reason why their music was joyous was because it was again leavened with Christian joy. After all, a hundred years ago blacks had much more reason to be miserable than they do today, and yet, that is when gospel music emerged and thrived. You'd think they would have been be as morose as the mullahs, but gospel is the very sound of joy, and virtually all the classic soul singers of the 1960s and '70s were trained in the church (not to mention all of the early fathers of rock, e.g., Elvis, Jerry Lee, Johnny Cash; rock only starts becoming palpably dark in the late 1960s, after being hijacked as the primary means of expression for the cultural left). After all, Christianity (we're going to leave Judaism to the side, because it is a special case) is quite literally the original liberalism -- liberality of mind, of heart, and of body. This is precisely what set it apart in the ancient world: what in the name of Zeus are these people so damn happy about? Now, this is not to say that the history of Christianity doesn't reveal the gradual encrustation and suppression of this primordial joy -- after all, we're talking about humans here -- but the joy always breaks through and returns, because that is what Christianity is, essentially. Good news, right? Few writers more effectively convey the sober silliness of this truth than Chesterton. St. Thomas was, for example, "one of the great liberators of the human intellect." This cannot be emphasized enough, because virtually all the competing philosophies of modernity are enslaving, not liberating. Starting with Descartes and Kant on down, most modern philosophies condemn us to a prison of neurology, or linguistics, or economics, or race, or power, or the unconscious, or what have you. We descend from "the truth sets you free" to "there is no truth, and you're not free to discover it anyway." Thomas says NO: that you are -- at least potentially -- liberated into the real world, which is both beautiful and intelligible, the very ladder with which we may reascend to the Creator. He brings the good intellectual news that "the senses [are] the windows of the soul and that the reason [has] a divine right to feed upon facts..." It is Thomas who teaches "that Reason can be trusted," whereas "it was the very life of Lutheran teaching that Reason is utterly untrustworthy." Thus we see a hidden and unappreciated link between this latter tradition and any other modern or postmodern philosophy which denies man the intrinsic right to know What the Hell is Basically Going On. Not the details per se, but just the possibility. As we have rhetorically asked in the past, why on earth are the people who so denigrate humans called humanists? Thomas and his ilk are the ultimate humanists, in that they insist "on the immense importance of the human being in the theological scheme of things." And when we say "human being," we again mean in all dimensions, body, soul, and intellect. You might say that the body is entitled to joy for the same reason the intellect is entitled to truth and the soul to beauty. God did not create us to starve in a prison of matter or a desert of quantity. Indeed, "a Christian means a man who believes that deity or sanctity has attached to matter or entered the world of the senses." Thus, the Christian Raccoon is literally the most materialistic of all, just as he is the most humanistic. If Christ is "the miraculous medium between heaven and earth," then matter is infused with the highest principle. Every good scientist knows this, and yet, places an arbitrary limit on his own mind, or sets up a roadblock at the outskirts of logic. Chesterton's pal Belloc says much the same thing, that "delight in existence itself" is "the highest mark of sanity and and reality." The ephemeral is always bisected by the permanent, and our task is to recognize this perpetual crossroads and know that I AM. It's why we call it The Vertical Church of What's Happening Now. Once again insophicient time for a fully half-baked post. Since it is Mrs. G's birthday, I magnanimously volunteered to transport the Boy to school. In The Science Before Science, Rizzi writes of how "The temptation to sacrifice reality for clarity has trapped many an otherwise strong and competent thinker." In fact, it seems to trap most any thinker, so long as he is reduced to swimming in his own ideas. In the Christian tradition our natural reason is "healed," or, if you prefer, prolonged, by transnatural grace, which is really the only way for reason to exit its own tautology -- to escape the clutches of Gödel and to turn it from a closed circle to an open spiral. We could also say that we are unknowculated against the Big Bad Idea in light of the fact that the first and last metacosmic fact is Person, not any abstract idea. Certainly no mere idea can save us, no matter how stupid. As we have said before (paraphrasing someone), the answer can be the disease that kills curiosity; or, it can confer a kind of quickndirty knowledge that actually prevents -- or pretends at -- understanding. Thus, Rizzi writes that "a clarity that appears too soon or is too broad and facile is likely to be a counterfeit achieved by ignoring the full depth and breadth of the reality under consideration." "The primary things in the universe, before all letters and all language, are a note of exclamation and a note of interrogation." If I understand him rightly, he is talking about ! and ?. In the book I combined them into (?! ), AKA the sacred WTF. Chesterton seems to pathologize the (? ), linking it to serpentine skepticism and to our primordial calamity: "nor has there been any other battle since the beginning of the world." But what if we regard them as complementary rather than oppositional? In that case they will work together like anabolism and catabolism, or analysis and synthesis, i.e., breaking down and putting back together; or, perhaps the joyous (!) of the right cerebral hemisphere complemented by the more detached (?) of the left. One could also say that the science before science is a kind of pure (! ), i.e., the overwhelming facticity and utterly surprising intelligibility of being: there is reality, always staring us in the face. Unless our senses are like totally lying to us, in which case you are confused or deranged or tenured (but I repeat myself). This is of course where science begins, and must begin: with our experience of the objects of sensation. But then comes the (?) with which we investigate those objects of experience. Now, either there is a rational foundation of our intellectual life, or there isn't. And regardless of what any postmodern (or post-Aquinas, really) philosopher pretends to believe, he still begins in the pre-rational world of (! ), only departing from it in thought. "Thus," writes Rizzi, such pneumapaths "oscillate between unconscious acceptance and a conscious rejection." This is the primordial incoherence at the heart of modern incoherence. "Such a rejection leaves the root of one's thinking ungrounded, hanging in the air, where it is free to blow in the wind of one's will" (ibid.). Or, one could say that the Primordial Rejection of O is founded on a conversion of will to willfulness, or from freedom to compulsion. The divine gift of freedom is hijacked, so to speak, by motives having nothing to do with truth. Therefore, as anyone who hasn't attended graduate school already knows, "to say that there is 'no such thing as truth' is to say words without meaning" (ibid.). However, when we affirm the truth of Truth, we are by no means talking about anything the human mind could ever contain, thank God! You might say that if we could know it, it wouldn't be Truth. Rather, it always contains us. Didn't get far with this, and now I have to get some work done. Bad traffic taking the boy to school, which is why Obama needs to give amnesty to all those illegals, so our streets can become even more crowded and maybe people will give up driving and Save the Planet. "improvident habits, slovenly systems of agriculture, sluggish methods of commerce and insecurity of property exist wherever the followers of the Prophet rule or live. A degraded sensualism deprives this life of its grace and refinement, the next of its dignity and sanctity. The fact that in Mohammedan law every woman must belong to some man as his absolute property, either as a child, a wife, or a concubine, must delay the final extinction of slavery until the faith of Islam has ceased to be a great power among men" (Churchill). Just sayin'. The same could be said of Christianity, but only by someone as incredibly courageous, intellectual, historically informed, and unconsciously Christianized as, say, Bill Maher. Yes. For example, Chesterton expresses it well when he speaks of how "Any agnostic or atheist whose childhood has known a real Christmas has ever afterwards, whether he likes it or not, an association in his mind between two ideas that most of mankind must regard as remote from each other" -- specifically, that there is a deep relationship between infant and Cosmos, or between the impotent baby and the omnipotent Creator. We often hear liberals claim how their latest power grab is All About the Children -- which it usually is, in a perverse and destructive way -- but they are nevertheless what Chesterton calls "psychological Christians" even when they aren't "theological ones." They are the form without the content, the intelligence without the wisdom, and especially the sentiment without the substance. 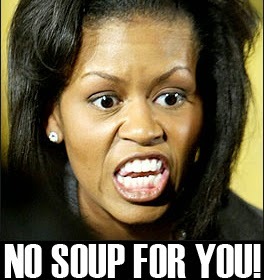 I mean, consider our children's Soup Nazi, Michelle Obama. Now, think about Obama, who boasts that America is one of the largest Muslim countries in the world, but sends the bust of Churchill back to Mother England. How nutty is that? So, we have a choice: Obama or bust. We'll take the bust back, please. Rebecca Bynum writes of how, in the Christianized west, there are distinctions between God, religion, and the political order. Not so in Islam, where these three are permanently fused: "Islam has effectively replaced God. Since for Muslims the only allowable method of finding God's will is obedience to Islam, for all intents and purposes, Islam is God." This is what troubles me about evangelical predestineers, because if their doctrine is true, it is literally the case that there is no distinction between God and creation, therefore man = God. In other words, if everything I do and think is a direct result of God's will, how am I distinct from God? I am no longer an individual, nor do I have any rights or duties, since I am just a divine cat's-paw. Think again of how this differs from orthodox Christianity, in which the most helpless thing in the world -- the human infant -- is of ultimate value. In Islam it is the other way around, i.e., it preserves the downside-up reality that Christianity is here to invert: "Like a hive of bees, the group must be protected by the sacrifice of the individual. Islam is the queen for which all individuals sacrifice" (ibid.). Who needs it? Sometimes even I can't help thinking I am degrading the higher things by associating them with the festering sump hole of politics. However, politics is always a first order concern, on the same rank as family -- family being not only the real unit of politics, but the most important mediating structure between citizen and state. This is why the left is fundamentally at war with the traditional family, because it is in competition with the state for our allegiance (e.g. their archetypal parasite Julia). Eliminate the family and you can have a nice two-tier system of State and subject. Thus, not only do women vote Democrat because they are single mothers, but they are single mothers because they are Democrat -- or at least because they have assimilated its dysfunctional ethos and "ordered" their disordered lives to it. This is what Nancy Pelosi means when she says that the triumph of conservatism would spell the end of civilization. Yes, she is engaging in hyperbole by flattering leftist culture with the term "civilization," but she is correct that we pose a threat to their way of death. In the order of Things That Matter, politics is -- unfortunately -- near the top. As Charles Krauthammer writes in the introduction to his book, politics "dominates everything because, in the end, everything -- high and low, and most especially, high -- lives or dies by politics" (emphasis mine). Thus, we "can have the most advanced and efflorescent of cultures" -- hey, I'm old enough to remember! -- but "get your politics wrong... and everything stands to be swept away." While the mind is more important than the body, if we ignore or mistreat the body, it will drag the mind down with it. It's the same with art, science, medicine: in one sense they are obviously higher than politics, but in another, "fundamentally subordinate. In the end, they must bow to the sovereignty of politics." In short, when politics is rightly ordered it allows the higher things to flourish, but "when malign, to make all around it wither." Or maybe you haven't noticed. What is interesting -- or disturbing anyway -- is that conservatism IS the simultaneous recognition of the centrality and triviality of politics. Because our souls are ordered to vertical reality, we do not confuse politics with the Permanent Things which a proper political order permits to flourish. Not so the liberal, and for several reasons. First, since he lives in the fantasy of a horizontalized world, he is by definition unable to rightly order his life to what is important. "Importance" is a function of hierarchy and nothing else, so if we eliminate hierarchy, then either nothing matters (nihilism) or everything is of the same consequence (moral relativism, multiculturalism, "diversity," "tolerance," boredom, etc.). But in the end, these two reduce to one another: leftist politics is just slow-motion nihilism. But man's ontological station, as it were, is at the crossroads between vertical and horizontal. As such, man is infinitely distant from the animals, because any degree of verticality is as one is to zero -- or the third dimension to the second. Animals don't have history for the same reason planes don't have spheres. At the same time, this explains why history is not accidental to man, but essential. And only the Judeo-Christian stream of metaphysics recognizes this. Even a benign religion such as Buddhism regards history as so much smoke in a windstorm, while a malign religion such as Islam regards it as nothing more or less than the direct will of Allah, with no human mediation. For them "history" is a chronicle of Allah's inscrutable whims, whereas for us it is the residue of a drama that unfolds between man and God. History has meaning because it has an origin and a destination, a ground and a telos. And meaning is only possible if there is freedom, otherwise everything ultimately "means" either matter or the Absolute. God gave us freedom so we could discover meaning. There is no other way. Thus, to even discover intrinsic Meaning is to have discovered God, even if your metaphysic doesn't permit you to have this 20/∞ inSight. "First and above all else," writes Krauthammer, "you must secure life, liberty, and the rights to pursue your own happiness. That's politics done right, hard-earned, often by war." Thus, being awarded a Peace Prize is a pretty clear message that you've gotten your politics dreadfully wrong. The deeper purpose of politics "is to create the conditions for the cultivation of the finer things," e.g., truth (theology, philosophy, and science), beauty (art), and virtue (human development). But as alluded to above, the "goods" secured by politics are outside and beyond politics. If you secure politics for its own sake -- AKA power -- then you are a leftist. Returning to the intrinsic pathologies of liberalism, another consequence of its confusion is the unwitting elevation of politics to religion. This liberals do because man cannot eliminate his own verticality, any more than fish can live in trees. Religion involves many imperatives and subcategories such as the sacred, the holy, the pure, salvation, damnation, etc., so these too end up conflated with politics. Running short on time here, but this piece called The Varieties of Liberal Enthusiasm implicitly goes to many of the themes touched on above. Very little time this AM -- so little that I had to abbreviate morning as "AM." Continuing with Friday's post, it seems axiomatic to me that if humans did not have free will, then they couldn't possibly know it, for there would be nothing separate from necessity, i.e., no space across which to view it. If we are in the land of necessity, then so too is every thought necessary; and if necessary, then unable to be anything other than it is. Therefore, statements are not true or false, only necessary. Thus, in a very real way, to say necessity is to say freedom; I believe someone once made the crack that freedom is awareness of necessity. That is the least one can say of freedom: that it is something other than necessity. But what is it actually? In other words, that minimum definition is like saying that light is awareness of darkness. It lets you know light exists, but doesn't tell you anything about it. Moreover, it is misleading, for it implies that darkness is the substantial reality, light a kind of nebulous absence or privation. Now, in a certain way, truth is parasitic on error for the same reason that freedom is awareness of necessity. Certainly science proceeds strictly on this basis: it is a continuous exercise in trying to disprove one's current beliefs. It is very much as if science cannot know truth, only chip away at presumed error. Which is not nothing! But it is not, and cannot be, truth. Nevertheless, as we've been insisting over the past I-don't-know-how-long, man has a RIGHT to truth. In other words, all men and any man have always had a right to know what the hell is basically going on, i.e., what is the metacosmic truth and how to order ourselves to it. I would say this is definitional of man qua man: that man is the being who is entitled to truth, dammit, thank you very much. But because he is so entitled, it means that he is entitled to the cosmic conditions that render truth possible. Thus, first and foremost, man is entitled to freedom, since, as alluded to above, no freedom, no truth: the two are inseparable; it is not possible to think the one without the other. Or, you might say that we "think freedom" so as to "act truth" (and vice versa). Right? Right. It seems to me that this goes to the Science Before Science; I would say that we are entitled to the science before science, but that we have to work for the science after science, i.e., ordineveryday worker bee type science. Again, consider the Muslim world, where people aren't entitled to freedom. Therefore, they aren't entitled to truth. Therefore, science cannot develop. To what then are Muslims entitled? The Koran. What is the Koran? The direct, unmediated, infallible, inerrant word of Allah. Unlike the Bible, it is not to be interpreted, because for one thing, that implies some sort of human freedom engaging with the text. I guess I don't have to remind the reader that certain strands of modern Christianity are indeed more similar to Islam than to a Christian worldview. Islam means "submission," and that is what it is: submitting to absolute necessity, i.e., cashing in one's freedom. The whole thing is rather confused, for how is submission possible if everything is necessary? Submission either implies freedom to submit, or else it cannot be meritorious. But let's let them sort out their own incoherence. We're more worried about our own Muslims in Christian clothing. A mirror image of this pneumapathology is seen in the left's so-called "tolerance," in that it is an indefinable nothing. It is related to the negative definition of freedom in paragraph 2 above: tolerance is just the absence of intolerance, which, if you think it through to the next step, is the active acceptance and embrace of EVERYTHING. In short, it is the complete abandonment of discrimination, taste, propriety, decency, judgment, maturity, and good breeding. In them it induces pleasant feeling of sanctimony. In us it induces vomiting. So that's the main difference between left and right. It is not a question of intellectual differences per se, but a question of the gastrointestinal tract. Embodiment, don't you know; to paraphrase Don Colacho, it is an investigation of the causes of what disgusts us. For I don't doubt that we disgust Obama, just as he disgusts us.